Is it Rotterdam, or even Hamburg? No – the largest freight port in the world isn’t located anywhere in Europe. Several decades ago, the continent’s ports were outclassed by harbors in Asia. Singapore was long the ocean freight hub with the largest transshipment volumes, until it was overtaken by the Chinese megacity of Shanghai. The port of Shanghai has had a long and rich history ever since the Qing dynasty in the 16th century. Its international importance started in the middle of the 19th century, when it was forcibly opened for trade with the colonial powers of Britain, France, Japan, and Germany as a result of what are known as the “unequal treaties”. Following the city’s occupation by Japan during WWII and its incorporation into the People’s Republic in 1949, it would take Shanghai and its port several decades before they would again assume international prominence. This was due in part to the Chinese government favoring Beijing as a site for business, but also because of the fundamental economic weaknesses of the state. Things did not begin to change until 1991, when the communist authorities adopted a new set of economic policies. This transformation resulted in a boom in Shanghai and in other metropolitan centers along the Chinese coast, with annual growth reaching double-digit figures. Funding and special privileges enabled Shanghai to become a motor driving the modernization of China. 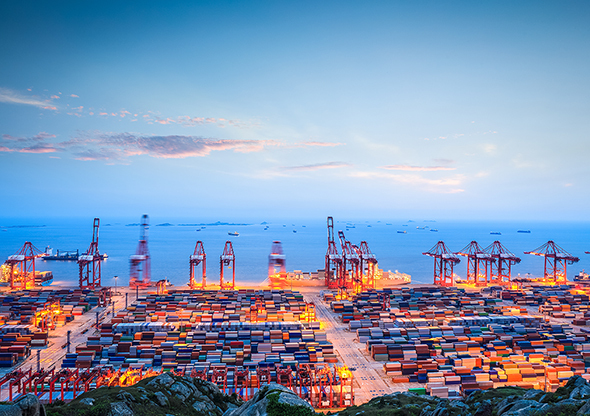 Thanks to its location on the Yangtze river and the East China Sea, Shanghai’s freight port has become a national and international hub for ocean freight. As a result of China’s new economic approach, Shanghai’s harbor saw its importance increase. Now managed by the Shanghai International Port Group, the port’s transshipment volume tripled in just a few short years, going from 186 million metric ton in 1999 to 537 million metric tons in 2006. However, this surge was not due merely to China’s economic growth alone, but it was also the result of several regional facilities being merged to form a single port. This move was enough for it to take the crown of the world’s most important sea port from Singapore in 2006. Today, Shanghai’s port handles 37.13 million TEU (figure from 2016) and continues to lead the league table for container transshipment ahead of Singapore (30.9 million TEUs). All the same, the megacity’s authorities see no reason to rest on their laurels. The opposite is, in fact, the case: Further growth is expected, so Shanghai is currently constructing an entire new port. An undertaking that has so far cost the operator the equivalent of EUR 1.31 billion. The Yangshan terminal is scheduled to start fully automated operation at the end of 2017 and add an additional 6.3 million TEUs in annual capacity. But, as they say, competition never sleeps. Just 700 km away, the city of Qingdao is building a new port that could well give Shanghai a run for its money as it diverts capacity away from the Yangtze. Published with permissions from logistik-aktuell.com. Original article published here https://logistik-aktuell.com/2017/09/15/infrastructure-the-worlds-most-important-freight-port/. Note: Since this article was published, Shanghai International Port Group (SIPG) has reported that Shanghai Port has surpassed an annual handling capacity of 40 million TEU, according to China’s official press agency.